KUALA LUMPUR: The property market is expected to moderate in 2012 due to continued slowdown in global economy amid growing concerns on the Eurozone debt. The uncertainty in the market in view of the impact from the upcoming 13th general election will also influence the expected lacklustre performance in the property sector next year. Association of Valuers, Property Managers, Estate Agents and Property Consultants in the Private Sector (PEPS) immediate past president James Wong said he expects banks to be more conscious in loan approval next year as loan eligibility is now based on net income as compared to gross income previously. "Over the years, property sector experienced oversupply of product, especially in the high-end condominium and offices. In addition to other factors that were mentioned, we expect to see a dip in property market performance next year," Wong said. During the first half of this year, the property market registered an overwhelming 214,764 transactions worth RM64.75 billion. This represents a growth of 18 per cent and 29.7 per cent respectively against the same period in 2010. "The year 2010 was acknowledged by all as a good year for the residential sector, which was then reflected in the volume and value of transactions," said Wong. The market was expected to soften this year but it went against the odds, spurred by government projects, especially those under the Economic Transformation Programme (ETP). PEPS president Choy Yue Kwong said the world is concerned with the possible contagion effect of the Eurozone financial crisis. "Locally, home property prices have risen significantly over the past two and a half years and the market is concerned if there will be a property bubble," Choy said. He said these are among the issues that will be discussed in the upcoming Fifth Malaysian Property Summit 2012 (5MPS), which will be held on January 17 next year. GEORGE TOWN: Hunza Properties Bhd will submit plans to the local authorities next year for a mixed-development project in Bayan Baru with a gross development value (GDV) of RM6bil to RM7bil. Executive chairman Datuk Khor Teng Tong told a press conference after the company's AGM that the group had engaged a couple of architects from Singapore to draw a master plan for the project sited on over 16.2ha, opposite the Bukit Jambul Complex. Khor said the group had just acquired 2ha for the development of 1,000 units of low-cost homes for the households currently occupying the over 16.2ha site. “We have initiated steps to obtain approval from the local authorities to develop the low-cost homes. Once the approval is obtained, it will take about 18 months to complete the low-cost project,” he said. On the Gurney Paragon Mall, Khor said the second phase of the project would be completed next year-end and would open in March 2013. The second phase, comprising the corporate headquarters and shopping mall, was now 50% completed. “The first phase has been completed with certificate of fitness obtained,” Khor said. Hunza Properties Bhd (HPB) expects to submit plans to the relevant authorities by the middle of next year for its proposed integrated development in Bayan Baru on Penang island. 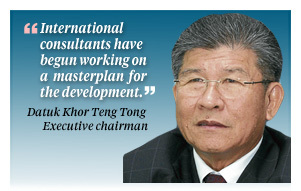 The company's executive chairman Datuk Khor Teng Tong yesterday said that international consultants have begun working on a masterplan for the development, which is expected to carry a development value of between RM6 billion and RM7 billion. The company had purchased 16.9 ha of prime land in Bayan Baru for RM82 million. "Our plans will be in tandem with the Penang state goverment's vision to turn the island state into an international city," Khor told reporters after the company's annual shareholders meeting. Khor said the company has initiated getting the necessary approvals from the state authorities to build affordable housing units for squatters affected by the proposed project. "Over and above the 16.9ha land, we also purchased 1.6 ha in the surrounding area in order to build around 1,000 low-cost units to house the affected squatters," he added. "Once all approvals are obtained, we expect to complete building the affordable homes within 18 months." Khor also said the Gurney Paragon condominiums, which are located at the sea-fronting Gurney Drive promenade, are now 70 per cent sold with its certificate of fitness for occupation obtained in June this year. "Construction work on our Gurney Paragon lifestyle shopping mall continues and is targeted for completion during the second half of 2012," he said, adding that the first phase of the Gurney Paragon mall (which comprises food and beverage outlets housed in the historical St Joseph's Novitiate premises) will open soon. He added that HPB's leasing team has been tasked with ensuring an optimum tenant mix and one of the main features of the new mall would be to bring in established shops and operators that are not present in Penang as yet. For its 2011 financial year ended June 30, HPB recorded RM63.7 million in net profit after tax and minority interest. This compares with RM50.9 million during the previous corresponding year. Spacious: The Saujana O-lot villas are constructed to give house owners an ample private area similar to those of a bungalow. BREAKING away from the conventional semi-detached houses is the zero-lot concept. Purchasing a zero-lot home is soon becoming a popular choice among house buyers as these units look similar to a bungalow. Focal Aims Land Holdings Berhad group general manager Shawn Yee explained that the zero-lot concept meant one side of the house had its side wall close to the boundary while the adjoining house is set back from the same boundary. “At a glance you do not even realise it is a semi-detached unit because each house looks exactly like a bungalow with a garden to accompany it,” he said when explaining the Johor-based company’s latest development, the Saujana O-lot in Shah Alam. Built on a 10.48ha hilltop overlooking the Federal Highway, the 48 houses come in two designs — D-Villa and SD-Villa. Yee said D-Villa has a minimum built-up area of 4,437sq ft while SD-Villa only has a minimum built up of 3,572 sq ft. The difference between the two villas are not just in size but in exclusivity as only three D-Villas are available with a starting price of RM2.8mil. 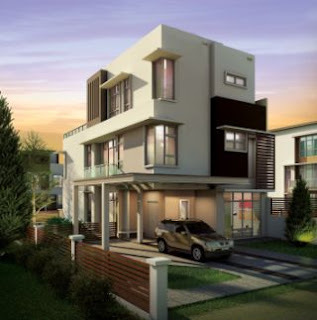 The remaining 45 units are in the SD-Villa range, which offers a starting price of RM1.6mil. Residents of Saujana O-lot need not worry about recreational spots or shopping centres given its location just off the Federal Highway. “Just minutes away is the Glenmarie Golf Club, Saujana Golf Club and Subang Golf and Country Club,” he said. Shopping centres and hypermarkets such as Carrefour, Subang Parade, Citta Mall and Empire Subang are also located nearby. Those who enjoy walking or running around the neighbourhood can utilise its jogging paths and pedestrian footpaths built around lush garden hedges and beautifully-landscaped water features along the gated-and-guarded area. On accessibility, residents can get home from their work place through the New Klang Expressway, Damansara-Puchong Highway and Federal Highway. For details, visit the Focal Aims Land office at Peremba Square, Shah Alam or call 03-7622 9983. SP Setia Bhd is still planning to invest in the UK property market and will be forming a consortium with Malaysian investors after securing projects to help develop them, its chief said. "We learned a lot of things from our failure (in bidding for a project) in London. Now we know how the system there works. We are not reckless ... we will look at basic valuation for future projects," its president and chief executive officer Tan Sri Liew Kee Sin said. SP Setia was in talks with Irish Group Real Estate Opportunities (REO) to acquire a stake in the redevelopment of the Battersea Power Station in south London. The deal fell through as REO creditors REO had rejected its preliminary offer. SP Setia had on November 18 instructed its investment adviser to submit a conditional non-binding preliminary offer to buy from Lloyds Banking Group plc and the National Asset Management Agency, the senior debt facilities and the swap exposure and other related claims in the Battersea Power Station site and its holding company for around RM1.3 billion. 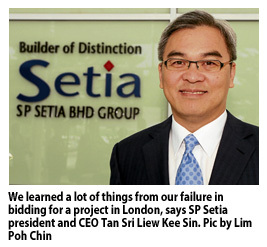 Liew said despite the aborted deal, SP Setia still believes that property development prospects in London are positive and it will continue looking for investment opportunities. "Looking at the situation today, we must look out of Malaysia to invest. We must be world leaders like Petronas and Tan Sri Tony Fernandes but don't be reckless in what you plan to do," he said yesterday after SP Setia's extraordinary general meeting (EGM). Liew said the firm's long-term plan is to seek opportunities to invest in the property market in Australia and Malaysia, besides London. SP Setia's recent success in penetrating the competitive Australian property market with the launch of its Fulton Lane project in Melbourne's central business district has given the company the confidence to explore other strategic global cities. "We have no plans for merger and acquisition. We will continue to grow the company by buying land, launching new products and selling them," he said. SP Setia is targeting RM4 billion in sales for fiscal 2012, driven by local and foreign property sales. At the EGM, Liew said shareholders agreed to SP Setia's plan to acquire the remaining 40 per cent stake in the RM6 billion KL Eco City project from Yayasan Gerakbakti Kebangsaan. "Now that we control 100 per cent of KL Eco City, there will be better prospects for SP Setia from this project," he said.